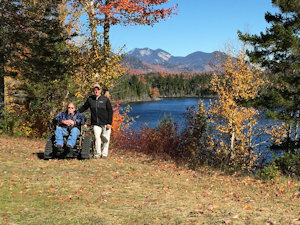 For more than a century, the beautiful Boreas Ponds property in the heart of the Adirondack Park was a private recreational getaway, open only to its owners and their guests, and to the private clubs that leased the land for recreational purposes. The owners built a dam to create the ponds and built an extensive network of roads to make it easy to visit them. In May 2016, New York State purchased the 20,758-acre property with $14.5 million in taxpayer dollars. "This will provide even more unparalleled settings for outdoor tourism and recreation," Governor Cuomo said at the time, "and I encourage New Yorkers to visit the region and see what they've been missing." Now, however, some groups are asking the Governor to declare this property "Wilderness" and once again severely restrict the public‘s access; in effect, closing the Boreas Ponds to the disabled, the elderly, children and anyone who is unable to walk long distances. Thank you for your interest in providing reasonable public access to the Boreas Ponds for you and your neighbors. You can email Gov. Cuomo and the Adirondack Park Agency by sending this form or clicking the links below. If you would prefer to send one message to both the Governor and the APA, simply fill out the form below and hit "Send It" and we will automatically submit your message to them on your behalf. We have included a sample message which you can send, however, we encourage you to write your own message in your own words, or copy and paste any of the paragraphs below that are important to you. I am asking that the Adirondack Park Agency classify the Boreas Tract a mix of both Wild Forest and Wilderness, as provided in the Adirondack Park State Land Master Plan. Of the several plans presented for consideration at each of the public hearings, Alternative 1 most closely provides the balance and access that would allow a range of recreational opportunity for people of all ages and abilities. When the purchase of the Boreas Tract was announced, both the Governor and DEC Commissioner recognized the need to balance ecological needs while providing a range of recreational opportunities for the young, old and physically limited. The APA's Alternative 1 plan will provide the recreational opportunities they envisioned, while boosting the lagging regional economy. Alternative 1 and the DEC's Unit Management Plan process can protect sensitive areas while at the same time, make use of the existing infrastructure within the tract to provide a full range of recreational opportunities. I believe that Alternative 1 for the Boreas Ponds Tract would provide balanced and fair use of the Boreas Ponds Tract. The Wild Forest classification best describes the land as it has existed for more than 100 years. The infrastructure created during its commercial use would support a broad range of recreational opportunities. That same infrastructure is contrary to the criteria that must be met to quality for a Wilderness classification. Wild Forest, according to the Adirondack Park State Land Master Plan, is an area where the resources permit a somewhat higher degree of human use than in wilderness, primitive or canoe areas, while retaining an essentially wild character. The Boreas Ponds Tracts is not Wilderness as defined by the APA's guidelines. The criteria for a Wilderness designation requires that the land should have a primeval character, without significant improvement, appears to have been affected primarily by the forces of nature and where the imprint of man's work is unnoticeable. The Boreas Tract is not that land. By the very early 1900's the Boreas Tract was already being used commercially. Man created more than 50 miles of gravel roads, several bridges, dozens of culverts and at least three dams, to facilitate its commercial use. Boreas Ponds is a man-made impoundment. Alternative 1 is the proper designation because it is Wild Forest as described in the Adirondack Park State Land Master Plan. Alternative 1 should be applied to the Boreas Ponds Tract because it will provide the balance between the environment and economic development that the Governor eluded to, and the access that Commissioner Martens said would be for everyone, not just the fit and hardy. Classifying Boreas as both Wild Forest and Wilderness will provide that balance and allow everyone some measure of access. The Boreas Tract was used commercially for more than 100 years and still, the land was able to sustain that use. Though commercially managed for timber, ecologically sensitive areas were shielded from abuse. Carefully developed Unit Management Plans used in conjunction with Recreational Management Plans, managed by the DEC could continue to protect areas deemed sensitive, while providing a full range of recreational opportunities. Balancing Wild Forest with Wilderness would increase the potential to attract more visitors to the Park to the benefit of the local communities. Alternative 1 provides the best opportunity to achieve the recreational, environmental and economic benefits that this land could provide for the people of New York.